The Queensland State Government yesterday released its annual shark count data, revealing more than 500 specimens had been caught since the start of the year and warning beachgoers to be careful in the water. A 4.1-metre (13 foot) tiger shark was the largest shark to be caught in beach protection nets this year, demonstrating how close swimmers can come to the predators of the deep. The animal was snared in drumlines off Townsville in October. Of the 505 sharks caught so far this year, more than 100 of them have been in Townsville waters. On average, about 50 have been caught at Cairns, the Capricorn Coast, Mackay and Gladstone between January and November this year. Fifty-two sharks, including a 4-metre specimen and 27 others larger than 2 metres, were caught further south at Rainbow Beach. Catch data also shows decent shark activity in southern waters, with a 3-metre great hammerhead found in shark control nets on the Gold Coast and a 4-metre tiger shark among 24 animals caught off Stradbroke Island. Primary Industries and Fisheries Minister Tim Mulherin said shark numbers were down on last year, when 578 were caught, however, there was still a month to go and conditions were ripe. 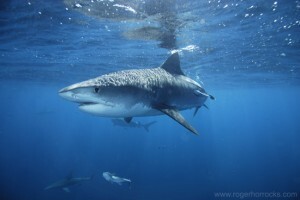 Rain and warm weather in recent weeks would increase shark movement, particularly among bull sharks. ”More than 500 sharks have been caught in shark nets or in drumlines since January since January, with 2009 set to be on par with previous years,” Mr Mulherin said. He said the catch demonstrated the importance of shark control nets, which came under scrutiny earlier this month when the Gold Coast City Council debated whether or not to scrap them. Some councillors believe the nets are ineffective and only serve to harm other marine life, including dolphins and turtles. Eight dolphins have been killed by shark nets on Gold Coast beaches int he past 12 months. ”Any size shark can cause serious injury or death if they attack, however sharks more than 2 metres long are particularly dangerous and are more likely to cause fatal injuries. To avoid the risk of attack, bathers should avoid swimming near river mouths, in canals, artificial lakes and waterways, with sharks more active early in the morning, evening and at night.